Walter is a positive, intelligent teenager who was involved in a serious swimming pool accident in the summer of 2013. As a result, he became paraplegic with very limited mobility in his arms. He lives with his father, younger brother, and grandmother. Walter has never once complained or let this serious injury defeat his spirit. When meeting him and his father, their cheerful personalities quickly became apparent. They were immensely appreciative that Welcome Home Angel had considered Walter Jr. for a project. 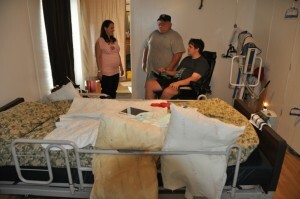 We can’t wait to provide some assistance to this amazing family. Furniture was ordered to better store medical equipment and supplies in his room but the rest of the project focused on helping Walter enjoy what he loves – the outdoors. The deck on the back of his house was extended to create more space for friends, an awning was installed to shelter from the rain and sun, and a motion activated trail camera was purchased so that Walter could see the wildlife behind his home.